The Hill House, Upper Colquhoun Street, Helensburgh, G84 9AJ. Please note The Hill House is currently closed due to restoration work. 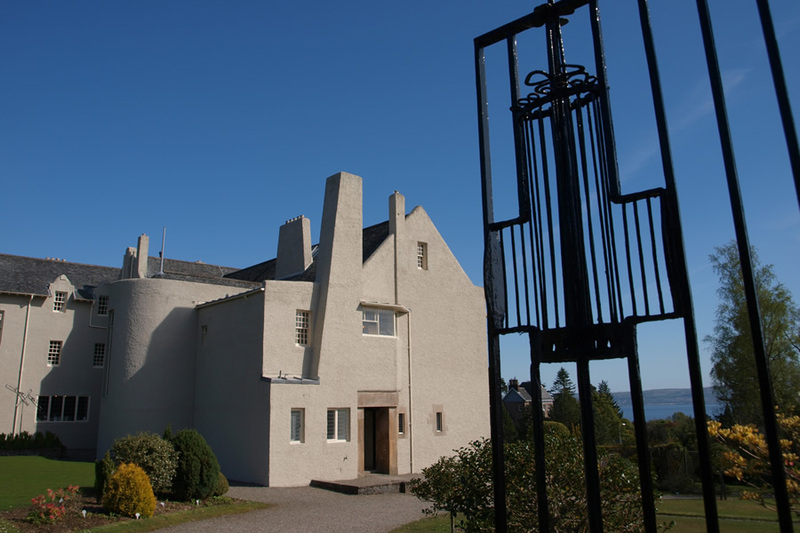 In 1902 Mackintosh received another significant commission when he was asked to design The Hill House in Helensburgh by Walter Blackie, director of the well-known Glasgow publishers, commissioned not only the house and garden, but much of the furniture and all the interior fittings and decorative schemes. The Hill House is now in the care of The National Trust for Scotland. The original furniture, fittings and interior designs have been reinstated or restored. The Hill House is some twenty odd miles from Glasgow via A82. Trains run from Glasgow Queen Street Station (Low Level) to Helensburgh Central. On arrival at Helensburgh Central visitors can either take a taxi (c £3.50) or walk up Sinclair Street (1.5 miles) and turn right into Kennedy Drive and right into Upper Colquhoun Street. On the eastern edge of Helensburgh; off A818, between A82 and A814. 23 miles north west of Glasgow. Rail:1/2 hourly service Glasgow Queen Street (low level) to Helensburgh Central Station (0870 6082608), then 1 1/2 miles walk or taxi.